The number of open, unfilled construction sector jobs continued to decline as housing construction softened during the first quarter. According to the BLS Job Openings and Labor Turnover Survey (JOLTS), the number of open construction sector jobs declined on a seasonally adjusted basis from an upwardly revised count of 116,000 in March to 94,000 in April. This is the first month below 100,000 open positions in construction since April of 2013. Winter conditions and other factors slowed the growth of home construction in recent months, and this likely reduced the number of jobs offered by builders and remodelers. On a three-month moving average basis, the open position rate for the construction sector fell to 1.83% for the month of April, continuing a decline begun in December. While the open rate has declined somewhat in recent months, the rate of open jobs in construction remains above any rate witnessed after the recession and prior to 2013. Monthly gross hiring in construction increased somewhat, rising on a seasonally adjusted basis from 257,000 to 278,000 from March to April. Over the same period, the hiring rate, as measured on a 3-month moving average basis, was effectively unchanged at 4.6% for April. Two trends in the construction sector are worth noting. First, the layoff rate for the sector (graphed above as a 12-month moving average) has continued to fall. Second, the sector hiring rate has fallen noticeably since the fall of 2013. 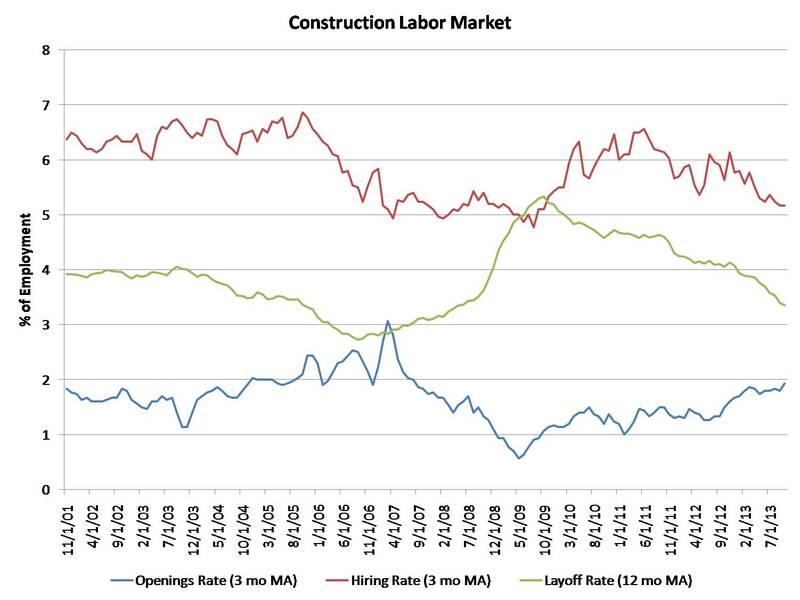 The trend lines over the last two years – a falling hiring rate, an elevated open rate, and a declining layoff rate – are consistent with some construction firms having trouble contracting with workers for specific projects. It is also worth noting that, on a seasonally adjusted basis, the construction sector unemployment rate stands at 8.9% for May, down from 11.2% a year ago. Construction sector unemployment peaked at 22% (seasonally adjusted basis) in February 2010. Monthly employment data for May 2014 (the employment count data from the BLS establishment survey are published one month ahead of the JOLTS data) indicate that total employment in home building stands at 2.259 million, broken down as 656,000 builders and 1.602 million residential specialty trade contractors. Over the last year the home building sector has added 106,000 jobs. Since the point of peak decline of home building employment, when total job losses for the industry stood at 1.466 million, 274,800 positions have been added to the residential construction sector. As of May, over the last six months the home building and remodeling industry has added on average more than 8,000 jobs per month. For the economy as a whole, the March JOLTS data indicate that the hiring rate was constant at 3.4% of total employment. The hiring rate has been in the 3.1% to 3.4% range since January 2011. The overall job openings rate (3.1%) ticked up out of the 2.7% to 2.9% range it has been in since the start of 2013. This may represent good news for future job creation after a tough winter. The number of open, unfilled construction sector jobs continued to decline as the unseasonably cold winter ended. According to the BLS Job Openings and Labor Turnover Survey (JOLTS), the number of open construction sector jobs declined on a seasonally adjusted basis from 127,000 in February to 104,000 in March. While still high relative to the post-recession period, the March level was the lowest since July of last year but the 11th consecutive month above 100,000. Winter conditions slowed the growth of home construction in recent months, and this factor could have slowed the number of jobs offered by builders and remodelers. On a three-month moving average basis, the open position rate for the construction sector fell to 1.93% for the month of March, continuing a decline begun in December. 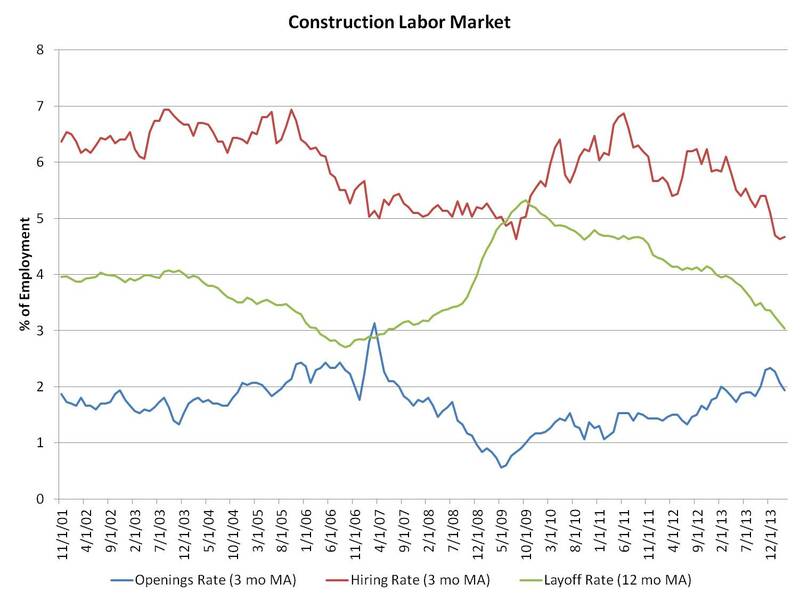 While the open rate has declined somewhat in recent months, the rate of open jobs in construction remains above any rate witnessed after the recession and prior to 2013. Monthly gross hiring in construction declined somewhat, falling on a seasonally adjusted basis from 289,000 to 260,000 from February to March. Over the same period, the hiring rate, as measured on a 3-month moving average basis, was effectively unchanged at 4.67% for March. Two trends in the construction sector are worth noting. First, the layoff rate for the sector (graphed above as a 12-month moving average) has continued to fall. Second, the sector hiring rate has fallen noticeably since the fall of 2013. The trend lines over the last two years – a falling hiring rate, an increasing opening rate trend, and a declining layoff rate – are consistent with some construction firms having trouble contracting with workers for specific projects. However, future employment reports will indicate whether recent hiring weakness is mostly due to weather effects or reflects new baselines for construction activity. Monthly employment data for April 2014 (the employment count data from the BLS establishment survey are published one month ahead of the JOLTS data) indicate that total employment in home building stands at 2.257 million, broken down as 659,000 builders and 1.598 million residential specialty trade contractors. Over the last year the home building sector has added 108,000 jobs. Since the point of peak decline of home building employment, when total job losses for the industry stood at 1.466 million, 273,600 positions have been added to the residential construction sector. As of March, over the last six months the home building and remodeling industry has added on average more than 11,000 jobs per month. For the economy as a whole, the March JOLTS data indicate that the hiring rate was constant at 3.4% of total employment. The hiring rate has been in the 3.1% to 3.4% range since January 2011. The current overall job openings rate (2.8%) has been in the 2.7% to 2.9% range since the start of 2013. The number of unfilled construction sector positions (124,000) reached a five-year high according to the October BLS Job Openings and Labor Turnover Survey (JOLTS). While the increase in unfilled positions in 2013 is consistent with the increase in construction sector activity, particularly for home building, the data continue to reflect only modest growth in total employment thus far. The rise in the count of open positions is thus consistent with reports of local labor shortages. For the construction sector, monthly gross hiring ticked up, rising from 299,000 to 307,000 from September to October. The hiring rate, as measured on a 3-month moving average basis, was unchanged at 5.2%. The pace of construction hiring has slowed since the end of 2012, and this trend has continued into the fall of 2013. Consistent with reports of some labor shortages for builders, the number of open, unfilled positions in the construction industry reached a five-year high. The total of unfilled positions in the sector for October (124,000) marks eight out of the last ten months for which this number has equaled or exceeded 100,000. Successfully filling open positions with qualified workers is a top concern for home builders in 2013. The October job openings rate (open positions measured as a percentage of current employment) for construction was 2.1%. Measured as a three-month moving average, the openings rate (the blue line above) has staged a noticeable rise since September 2012, although the growth in the open rate has slowed since February. This rise occurred at the same time as the hiring rate began to fall. Combined with a declining sector layoff rate (non-seasonally adjusted), charted as a 12-month moving average in the graph above, the uptick in open positions since 2012 suggests more, if modest, construction hiring in the months ahead – if firms can find workers with the right skills. However, the recent soft patch in some construction activity may also reduce the pace of hiring. The data for November will reveal if job openings for the construction sector will fall. Monthly employment data for November 2013 (the employment count data from the BLS establishment survey are published one month ahead of the JOLTS data) indicate that total employment in home building stands at 2.167 million, broken down as 596,000 builders and 1.571 million residential specialty trade contractors. 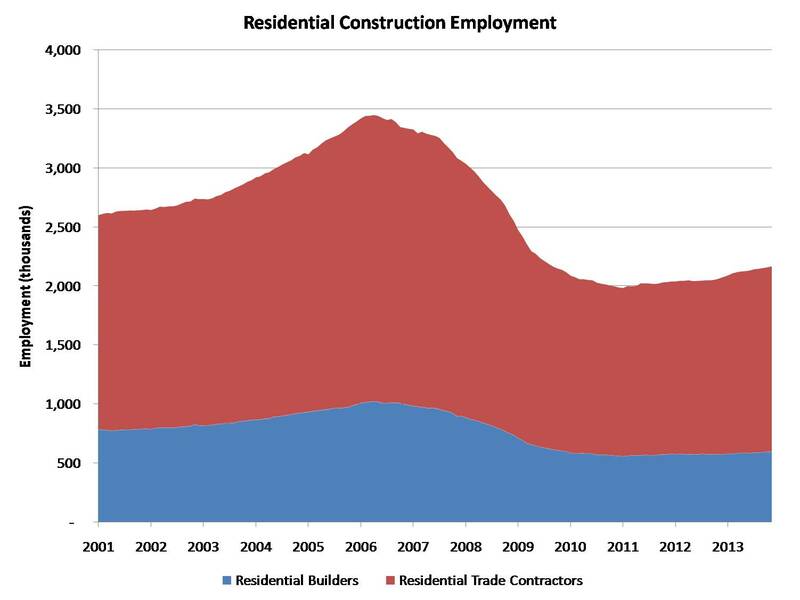 According to the BLS data, over the last 12 months, the home building sector has added 90,000 jobs. Since the point of peak decline of home building employment, when total job losses for the industry stood at 1.467 million, 184,000 positions have been added to the residential construction sector. Thus far in 2013, home building employment is averaging monthly net growth of about 8,200 positions. For the economy as a whole, the October JOLTS data indicate that the hiring rate was relatively unchanged at 3.3% of total employment. The hiring rate has been in the 3.1% to 3.4% range since January 2011. The job openings rate was unchanged at 2.8%, which matches the highest such rate since 2008.